Locations of the former Silverado and Porter mines relative to Stewart, B.C. Vancouver-based Strikepoint Gold has completed 4,304 metres of diamond drilling from surface last year at the historic Porter and Silverado mines near Stewart. The best assay was 819 g/t silver over 5.0 metres from the D vein at Porter. Other high grades with shorter intersections along the Blind vein included 2,241 g/t silver over 1.0 metre and 637 g/t over 2.0 metres. Strikepoint says this is significant because information from this vein was not included in the 2012 resource estimate. An even higher assay – 2,506 g/t over 0.5 metre – appears to be from a previously untested extension of the D vein at depth. The company noted that this is the first time that entire lengths of core from Porter have been assayed. The result is that extensive lower grade mineralization in smaller, sympathetic structures have been identified parallel to the main veins. 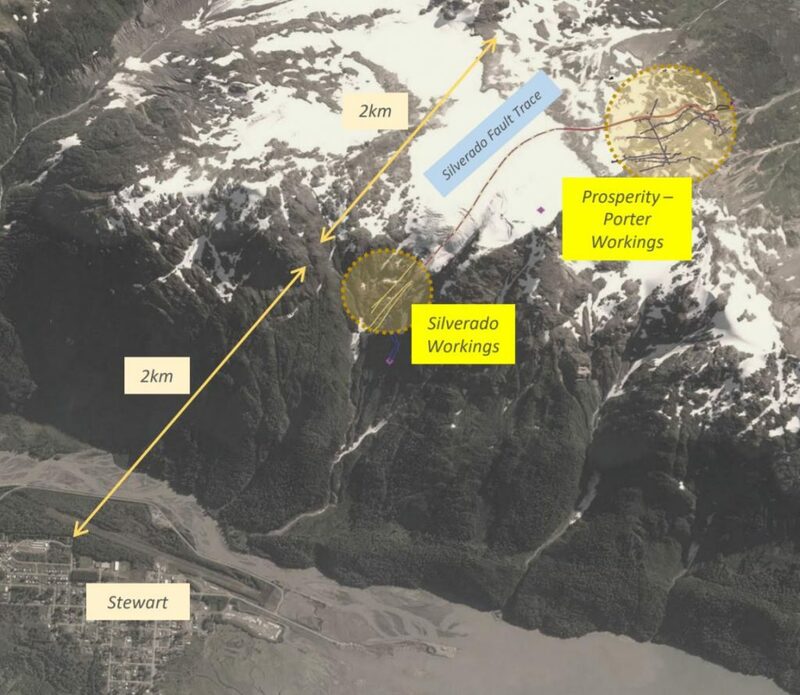 Drilling also encountered mineralization along structures outside the historical resource area and decreased the gap between the Porter and Silverado mine.